There are some fantastic works of art around featuring construction. 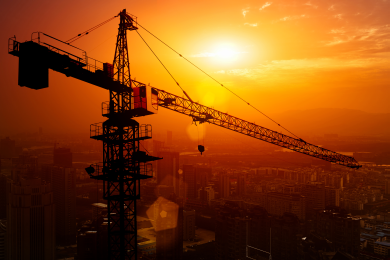 When one thinks of paintings or photographs of tower cranes either against a sunset backdrop or as the crowning feature of a city skyline, there can be no doubt that they do inspire creative thinking. In 2014, Austrian developers took the idea of using tower cranes for artistic intention to whole new level by using them as live props for a performing arts project, the likes of which had never been seen before. Aspern Urban Lakeside Vienna is Europe’s largest construction site and at the time 42 cranes, were being used for the development of a new 590-acre suburb. At Vienna’s Kranensee event in Aspern, the cranes were used to perform a synchronised light show with the drivers of the cranes controlling their choreographed movements. Local residents were invited to come and view the dancing cranes throughout the day and the 30-minute light show began after sunset. A time-lapse video of it was recorded and if you are interested in seeing exactly how it unfolded, follow this link to dailymail.co.uk and scroll down to find the video clip.